How to become a Professional Knitter - Robin Hunter Designs: But is it Art? I've been writing a presentation that I will be giving at my guild in March on why we knit. I've been reading a lot for this lecture and one of the books that I really enjoyed is pictured above. String Felt Thread by Elissa Auther. 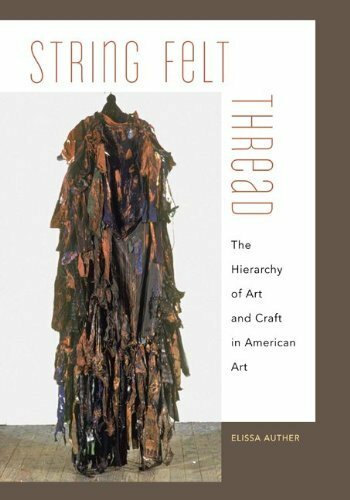 It covers the history of the American art world during the movement of fiber work from the "low" world of craft to the "high" world of art in the 1960s and 1970s. It looks at the work of artists like Miriam Schapiro, Judy Chicago and Faith Ringgold, as well as others who experimented with materials that previously had been dismissed for their associations with the merely decorative, with crafts and with women's domestic work. Auther specifically asks "What accounts for the distinction between art and craft?" The book discusses the roles of gender and race as they pertain to defining art. Auther looks at the shift in the art world from pictorial works to the acceptance of the modern installation pieces as well as the changing acceptance of the mediums that artists choose to work with. I've also been thinking a lot about designer compensation. I've been convinced that at least part of the problem is one of gender. I've read all of Annie Modisett's blog postings on this topic and she indicates that compensation has been stagnant since the 80's. Nora Bellows has a posting here addressing the topic of why we want to support indie designers as well. I had an interesting conversation with a peer about this topic and her view of the history of knitting design was pretty much the same as all area's where women were traditionally underpaid with justifications that have been reviewed during the women's movement. On one level this is actually a political discussion. I suspect that industrial designers like Karim Rashid don't have similar problems because their work is clearly accepted as linking art and design. I'd be designing with or without compensation but to be honest making money from the work is partially about validity and credibility to the rest of the world. In my case, like many of my peers as evidenced in the interviews I do here on the blog, I have alternative income that allows me to pursue designing. I do think that what I'm doing is art. I get the same feelings of accomplishment and self expression that I did when I was taking art instruction and producing work in accepted art mediums that were non-functional and simply hung on the wall. I see the requirements of fit and flattery for the wearer as part of the development of my technique in the same way that I had to develop the techniques to work with water colour paints in a different way than I did when working with oils. We discussed this at the Pro-Knitters group I belong to and the other members also felt that they were artists. What do you think, do you see your design work as art? Thanks, as always, for asking the thought-provoking questions, Robin!